The Apple netbook rumours just keep on coming… but considering this 10.4-inch laptop is so skinny it’d give Victoria Beckham a run for her money, coupled with the lack of practicality for any breed of port taking refuge around the laptop’s perimeter, it could be easy to deem the leaked MacBook Mini pics null and void. However, according to the Russian magazine supplying the info and images, the MacBook Mini will launch later this year for $899 USD (£640) – there’s even some specs. 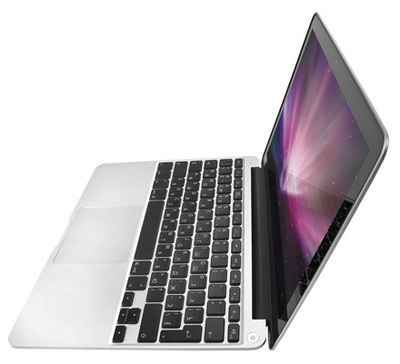 It will apparently sport a 64GB SSD, Atom Z740 processor and in true MacBook style, just one measly USB port. It’s still highly questionable whether Apple has given the go ahead for such a project, given the high end nature of the majority of its products and the low-end nature of the majority of netbooks on the market. But that didn’t stop Sony and the Vaio TT, so why should that put a spanner in the works for Apple? As soon as we know more, so will you. It looks great but seems a bit pricey for a notebook, is there the demand? ?